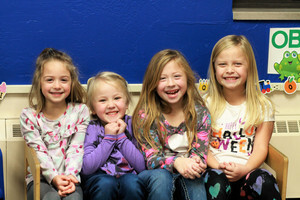 The Ashwaubenon Four-year Old Kindergarten Program (A4K) is open to all children who will be four years old on or before September 1st and either reside in the Ashwaubenon School District or qualify for open enrollment. A4K is a 5 day program held 2 hours and 40 minutes each day. Students who attend the morning session (8:00 - 10:40 a.m.) have the option to participate in the breakfast program. Those who attend in the afternoon session have an option to participate in the lunch program. All A4K classes are located at Cormier Early Learning Center and at community partner sites. Transportation is provided for all resident students. All sites offer curriculum that is aligned with the Wisconsin Model Early Learning Standards (WMELS). "Children learn by doing, exploring, and experimenting in order to form the foundation for future social, emotional, and cognitive development".